I'm not sure how sturdy these would be hanging on your arm, but look how cool these are! 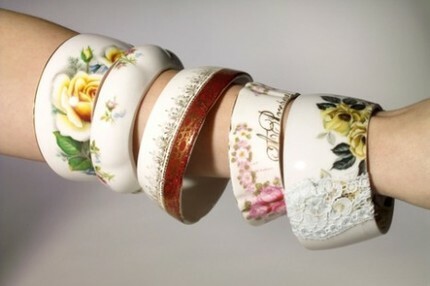 Made from real tea cups, these bangles are adapted by designer Abigail MaryRose Clark who also makes thimble necklaces and other jewelry using reclaimed objects. Makes me want a nice hot cup of tea and a biscuit.